Bactria, encompassing parts of modern-day Afghanistan, Tajikistan, and Uzbekistan, was counted among one of the easternmost provinces of the Achaemenid Persian Empire and the later Greek Seleucid Empire (one of the successor states that inherited Alexander the Great’s Empire). By circa 245 BC, its governor (satrap) Diodorus declared independence from the Seleucids to carve out the Bactrian Kingdom, which resulted in a syncretic realm that combined the elements and influence of Greeks, Sogdians, Indians, and even Indo-European nomads from the north. 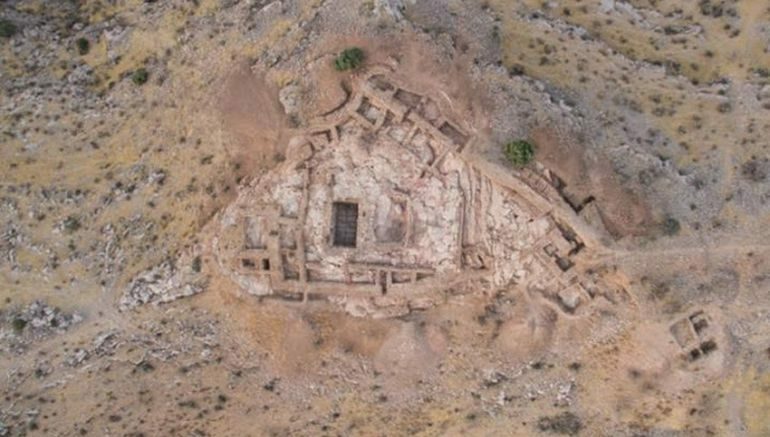 Pertaining to the latter, archaeologists from Russia and Uzbekistan have discovered an impressive border fortification system of Bactrian origin at Uzundar that played its crucial role in guarding the oases against the nomadic raids. Interestingly enough, the fate of Bactria as a Hellenistic Greek kingdom was cut short by the invasions of the very same nomads (like the Saka and the Yuezhi) by circa 2nd century BC. In any case, reverting to the northern fortress in question here, the structure actually harks back to the Seleucid period when Bactria was still an autonomous entity (as opposed to a fully independent kingdom), possibly dating from circa 295 – 290 BC, thus corresponding to the reign of Antiochus I. As for its layout, the fortification system at Uzundar boasted a diamond-shaped main quadrangular plan (compound) that enclosed the phylacterion (triangular citadel). This citadel was protected by double layered walls with an internal gallery about 30 ft wide, and extension walls, which were further strengthened with 13 rectangular bastion-towers, three of which were also outboards. Interestingly enough, with the advantage of GPS technology and terrain mapping, the archaeologists were able to discern the main access road and the existence of an external marketplace just outside the fortress compound. Pertaining to the latter, it is evident that the Uzundar fortress was an important military hub whose inhabitants/soldiers were accustomed to buying supplies from the market. Even more incredible is the possible discovery of a battlefield on the east side of the fortress – as is hypothesized by the findings of over 200 arrowheads and darts in the proximate area. This findings are sensational: direct analogies are known from the Takhti-Sanga temple, but there they were bronze, and we found iron fragments in Uzundar. To date, there are only a few specimens and sculptures with which to compare these cheeks and determine their type. We also found fastening details, which provide important information on manufacturing technology, according to tradition, but to answer these questions requires lengthy research. And lastly, other than just weapons and armor, the researchers also came across ceramic objects and coins, with over 200 numismatic well-preserved specimens made of silver (drachmas) and copper (mites). These coins do allude to how Bactria as a region was pretty economically developed with its monetary circulation network.